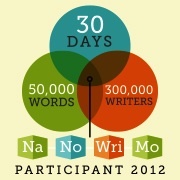 NaNoWriMo is here again. For those of the uninitiated, NaNoWriMo is National Novel Writing Month, where November is designated as the month to finally write that novel! There are local community get-togethers, helpful posts, trackers, and other online resources. The goal is to write 50,000 words before the last day of November, which means about 1,667 words per day. Last year, Joanna took on the challenge, and wrote a lovely historical YA novel during NaNoWriMo. She inspired me to try this year. I’ve adapted the challenge slightly to suit my situation. I generally write picture books and middle grade novels. Middle grade novels are typically 20,000-25,000 words. So to meet the 50,000 word goal this month, I will attempt to write two middle grade novels. Yes, two. Piece of cake, right? Not quite. Joanna makes it look too easy. If you write your tail off for 30 days, out pops a solid, well thought through draft, right? It’s a little more complicated than that (for me at least). I have planned the two novels. One is the story of a brother and sister who discover a portal in their hall closet that takes them to 1983. The other novel will be a sequel of sorts to a novel I already have in revision. So I’ve currently written just over 11,000 words of the first novel. As I expected, the writing ebbs and flows. I participated in PiBoIdMo (Picture Book Idea Month) last year with a similar experience. Some days the words flow and some days they don’t. What I didn’t expect was a somewhat non-linear process. I wrote from the beginning of my story to the end. I checked my word count- around 10,000 words. Hmmm. So I am now going back and filling out the characters, writing in more conflicts, and ramping up the stakes. But I have this nagging concern in the back of my mind: what if I fill out the story, add in everything I can think of, and I am still short of 25,000 words? I guess I can only write until there is no more to write, and then put it aside until I finish the second novel. Amidst family visiting (twice), my son’s sixth birthday, my husband’s <ahem> birthday, Thanksgiving, and Black Friday this month, I have my work cut out for me. I’m sure I will appreciate this in January when I have two novels to work with and revise! Is anyone else participating in NaNoWriMo this year? Any encouragement or general cheering on would be much appreciated! You can follow my progress at the counter on the right side bar. This entry was posted in Inspiration, Katie, Middle Grade, Personal, Writing and tagged middle grade novel, NaNoWriMo, National Novel Writing Month. Bookmark the permalink.